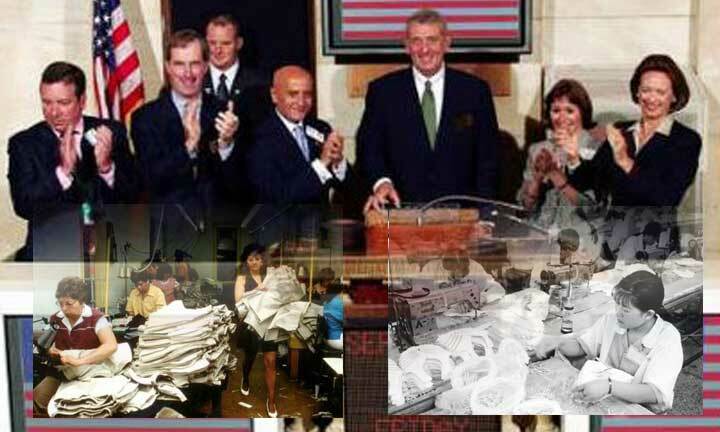 General Tommy Franks at the New York Stock Exchange, September 5, 2003. Franks commanded US forces in the US invasion and attack on Afghanistan. "Economic laws are not made by nature. They are made by human beings." scarcity When I took the first course in economics I learned that economics was the 'science' dealing with the rational allocation of scarce resources. consistent Today, while we have an oversupply of productive capacity, the global corporations set up global production facilities in low wage countries for the purpose of increasing global profits at the expense of domestic employment and domestic markets. Moving production facilities to low wage countries is not consistent with the rational allocation of economic resources and reinforces the trend to less global competition as global corporations continue to merge and become bigger. gimmick Yet the conventional economists, business people and politicians are brainwashing us about the need of being aggressive and competitive in the globalised economy of the Free Market. So all this business of being aggressive and competitive in the Free Market is just a gimmick invented by the global corporations and their privileged people. legal The corporative gimmick is to first ensure the legal framework for increasing global profits in the Free Market and only consequently, become competitive to lower cost of production and services. profits This gimmick, is what I understand to be the Race to the Bottom, a predictable economic race where rich countries continuously displace their workers and where low wage countries compete against each other for the employment of their people and for the profits of the global corporations. poor down In the United States, the race to the bottom can be appreciated as we find out that from 1979 to 1997 the average annual income of the top 1% increased by $414,000 while for the same period the income of the poorest 20% fell by $100. 35¢/hr In Mexico, U.S. factories are moving to China as the Mexican pay of $2.5/ hour cannot compete with 35¢/hour in China. war Today's Free Market is a sad predicament which ultimately justifies war as an opportunity to use the over productive capacity and expand the Free Market. destruction It is with pain that I realise the deception to depict the Free Market as democracy and see the destruction of many countries in the name of the democracy of the Free Market.